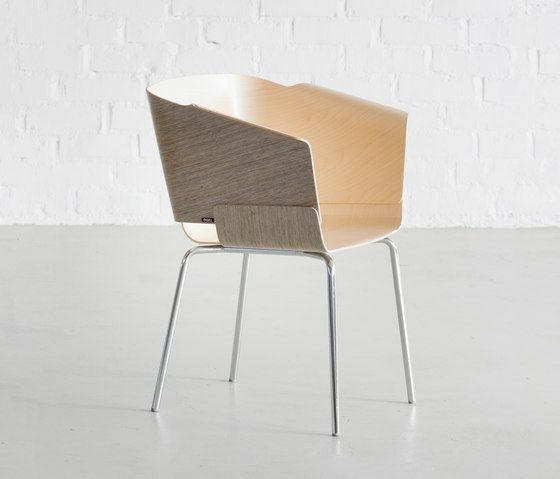 The Kaava conference chair is the first product to be made of Grada formable plywood. Grada is a completely new type of material, in which a special adhesive layer permits the shaping of wood composite material with the aid of heat. This technology is much simpler and faster than traditional pressing into form. It is suited to automated manufacturing while providing a sturdier and stronger structure. The glues used for the purpose are environmentally friendly and the material can be recycled after use. The whole seating part of the Kaava chair, with armrests, is cut and heat-shaped from a single piece of sheeting. The product development work was carried out together with the UPM corporation. Kaava received an Honorary Mention in international Fennia Prize design competition. The individual Fennia Prizes are awarded to companies in recognition of the comprehensive and innovative use of design. The Fennia Prize jury represents the design, business and media communities. The entries are evaluated on the basis of usability, responsibility and business aspects, as well as aesthetic properties, suitability to the visual environment and the communication of desired values. Seat either with fabric upholstery or without upholstery. Flanged and swivel bases are made of polished aluminium. The colours available for the metal base are silver, graphite and chrome.